Here’s a nice healthy recipe for all you peach lovers. It serves well as a fruit snack or desert. From a nutritive standpoint, peaches are somewhat underrated. Peaches provide a high amount of potassium, a shortage of which leads to a number of health problems. 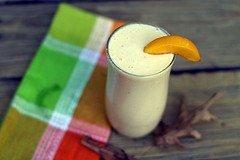 In combination with banana, this smoothie recipe provides plenty of this key mineral. Peaches are high in antioxidants and phytonutrients. They are a good source of beta-carotene, which the body converts into vitamin A, high in vitamin C, rich in dietary fiber, and studies have even revealed them to be anti-cancerous. And best of all, peaches are delicious, at least in my opinion. Incorporate some of the add-ons for more nutrition, and possibly turn this smoothie into a Pretty Peachy Green Smoothie by adding some baby spinach into the mix. I used raw milk in my smoothie and to calculate the nutritional information. Feel free to substitute your preferred milk – almond, coconut, hemp, etc. Enjoy! Place all the ingredients into your high speed blender and blend on high for 30-45 seconds until nice and smooth. Enjoy, and leave a comment below if you try this recipe, or have a variation of your own to share. Happy Blending! It looks truly horrible, but one of my favorite fruity smoothies is peach-blueberry. Make the above and add a handful of frozen blueberries. Yum. You’re right, peaches do love ginger, and because of that fact and your excellent comment I just updated this recipe. Peach Blueberry smoothie, I’m going to have to make that sometime soon and post the recipe. Thanks for the tip! Cannot wait to try it also. Considering that frozen peaches in December are better than most supermarket peaches in July, you don’t have to wait! Make one, it’s delish! I do like it better with almond milk or dairy milk (I drink raw) than water, but I’m a sucker for super-creamy smoothies. Works great with kefir, too. I made one with some leftover chai latte a while back and WOW. Chai and peaches go really, really well together.